« Mike Pence. I’ve heard that name before. There needs to be more dialogue like this – focus on causes of problems in order to work on something positive and concrete. Very well articulated and most thoughtful. Just as with the income/wealth divide, there are reasons that tension and resentment fester that are within our capacity to address. Absent attention, you will see more guns, more deaths, and more division. Not the American democracy as we “like” to think we live in. When talking about mental health issues lets not forget that 2/3 of all gun deaths are suicides. With more time for research (this post was conceived after the Baton Rouge shooting and came out late) I would have looked up numbers on police suicide, which I believe is a major problem. Of police suicides, it would be interesting to know how many of these policemen/women came from military service. There is a huge problem with suicide within the military….the reasons for which I am sure are complicated, but the numbers are staggering. Thank you for this it was well done. But our police are not conscripted. Wilson applied for that job voluntarily, and continued to do it after its nature became apparent. So this comparison strikes me as offensive. Given that many people may become cops without knowing exactly what it’s like, or may have become cops when it wasn’t quite this bad yet, and even given that many of them really need the money, it’s still not good to be putting the unjustly damned and our paid volunteer army of demons in parallel clauses as “both victims”. If they don’t want to be paid thugs for the 1% it’s still technically possible to quit. I altered the phrasing to remove the implication of equal victimhood. I recognize that some may still find the sentence offensive. The third narrative is explicitly on display in a popular music video from early last year, which uses two men in a fight to depict the black community and the police as being forced into an endless struggle that neither really wants. Listening the past week to both Police and BLM there is actually some intersection. Police spokesmen have been complaining about financial cutbacks that impact training. Specifically one national spokesman talked about waiting lists years long to get trained in non-lethal methods of force and de-escalation. The same spokesman also complained about poor screening of police, siting the Tamir Rice case as an example. One aspect of screening might also be not to give preferential treatment in hiring to those who served in the military. Many departments by law have to give preference to veterans — who are trained to fight enemies rather than to peacefully resolve disputes. Your mental health point should be expanded on. Next to black men, the second most at risk group from police (first in some areas) are the mentally ill. That is definitely a training issue and perhaps there should be specialists for the mentally ill. 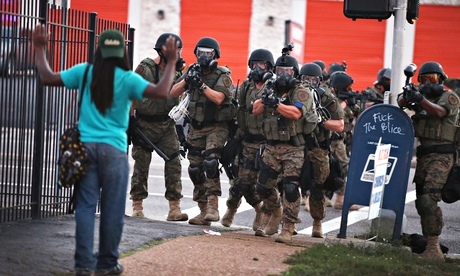 I think you may even understate the occupying nature of police in poor communities. On The Run, a book by a young sociologist who lived in a poor black neighborhood in Philadelphia for her graduate thesis and chronicles life there provides an eye opening view into life under occupation -eye opening even to those of us who think we have an inkling. That is not a situation in which a good policeman can remain a good policeman. I have worked with and been well served by police at many times during my life. They seemed to me ordinary people without the training and attitudes to equip them for some of the tougher and more fraught situations. Both they and DA’s and other’s in the justice system I interacted with had racial views similar to others of their race and class — a definite problem. Given that, perhaps traffic cops and others facing non-violent offenders shouldn’t be carrying weapons. If you need a gun to tell someone their taillight isn’t working, perhaps you need a different method that would put both officer and driver less at risk. Near the end of this article, The Atlantic’s Conor Friedersdorf suggests that traffic enforcement be a different service entirely. Such a traffic enforcement service would not need to be armed and would not be looking for evidence of other crimes. Ending the practice of funneling money to city and county governing bodies via traffic fines, court costs, etc. and more police officers specially trained to nonviolently deal with people with mental illness are two very good steps. A third would be to require independent investigative bodies (like civilian oversight committees) who are properly trained in relevant laws to investigate all officer-related shootings, whether by officers or civilians. Such committees’ reports would have equal evidentiary weight in courts. Excellent point, Janinmi. If you have time, view the PBS documentary, “Policing the Police”. Newark, NJ finally was successful in instituting civilian oversight committees. More are needed, not just for assuring the justice system works, but in drawing our election districts. Some states have set these up in lieu of allowing the Legislatures to politically draw districts that are heavily gerrymandered. The courts have ruled this procedure is perfectly legal if the states people vote for it. We just need to get changes like this on the ballot in more states…which is not easy. Especially in the states with the most egregious gerrymandering. Actually, it is a little hard to say it is easier — it took a long time. But it does point out that there is value in broadening the alliance. Libertarians are really concerned about this issue and are posting cases of police abuse of all races constantly (I get them from my Libertarian Friends) and those of us with mentally ill or handicapped family are also very concerned since they are also highly likely to be harmed by police. Even though young black men may be the most frequent victims, broadening the story can broaden the concern. I confess I was particularly impacted by the story of Kenneth Chamberlain who was shot dead by police. Mr. Chamberlain was an elderly black man whose safety alarm went off accidentally, calling the police who burst in to his home and gunned him down. Somehow, it impacted me a bit more because I thought of my father who also lived alone with a medi-alert bracelet. Some great information here, but the elephant is still sitting on the coffee table and nobody will or can mention it, for the obvious reasons. I agree Iceland is not Chicago. I am a liberal and a police officer’s Dad. I marched in Washington against the Vietnam war. I shouted at cops. Years later, we helped put our son through the police academy.​ And then I got nervous. He was 23 and a StLouis cop patrolling dangerous areas of the city. Suspects were fighting him. Guns were out a LOT. Everyone’s guns. He broke his hand and needed surgery after someone resisted arrest. He re-arrested felons he’d arrested a few months before. (Once he was next to someone he’d arrested at the practice range!) He started to pull the trigger a few times. He buried fellow officers. He called every night at midnight to decompress. America has problems because of severe income disparity. The haves and the have-nots. Same old story. For millenniums. And there are guns. We are the only industrialized nation with this many guns. More than the others combined. Trying to be a little more like Japan or Sweden or England wouldn’t be such a bad thing. Less super-haves and less have-nots. Sorry folks but it really is that simple. Police work where society has failed. Everyone is responsible for their own behavior, whether your parents abused you in Beverly Hills, or Harlem. Whether you grew up in poverty in Washington, DC, or Appalachia. If someone is a danger to the community, a cop will be called. Not a surgeon or an accountant. My son will be the one facing the thankless task of resolving a situation caused on the larger scale by a sick society, and by a law breaking citizen on the smaller scale. And if he’s arresting someone who is resisting, who is not showing his hands, who is making sudden movements in a car, who he perceives to be a real danger to him, his colleagues, and bystanders, I want my son, the Father of my grandchildren, to shoot. In a sick society he didn’t create, he’s the one in a role most of us cringe to ponder.